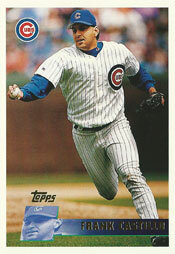 With the most important pitch of his big-league career, Frank Castillo tried to slip a fastball by Bernard Gilkey. One strike away from a no-hitter, Castillo’s high fastball was lined by Gilkey into right-center field. Sammy Sosa attemped a diving catch, but the ball landed about eight feet away from him and rolled to the wall for a triple. In 13 major-league seasons, Castillo was 82-104 with a 4.56 ERA. His best game was the one-hitter against the Cardinals, a 7-0 Cubs victory on Sept. 25, 1995, at Chicago’s Wrigley Field. Castillo, a right-hander, struck out a career-high 13. The game is recalled here in appreciation of Castillo, 44, who died on July 28, 2013. Facing a Cardinals club that ranked 27th in the major leagues in batting average at .248, Castillo was in command from the start. “I knew right from the first pitch … that I could throw any pitch I wanted for a strike,” Castillo said to the Chicago Sun-Times. Benefitting from a wide strike zone by home plate umpire Jerry Layne, Castillo walked two: Ray Lankford in the first and Tripp Cromer in the seventh. With two outs in the ninth inning, Castillo appeared poised to complete the Cubs’ first no-hitter since Milt Pappas in 1972. All that stood in Castillo’s way was Gilkey, the Cardinals’ left fielder and leadoff batter. After Gilkey fell behind in the count 0-and-2, Castillo threw a slider outside, followed by a low changeup, evening the count. Sosa had no real chance to catch the sinking liner. “This definitely was the best command I’ve had all year and probably in my career,” Castillo said.